Olav's Wood is a magical place - a mixed woodland with areas of dense forest, a haven for wildlife, through which runs an attractive burn with cascades and pools, all set in the almost treeless landscape of one of Orkney's islands. Visitors are welcome to explore the woodland. See the information on this website, including a guided walk, animals and plants you may see, and the history of the woodland. The landscape of Orkney, off the north coast of Scotland, is now mainly treeless. However, this was not always so and evidence suggests that early man in Orkney was at least partly responsible for the destruction of woodland (climate change may be another factor). 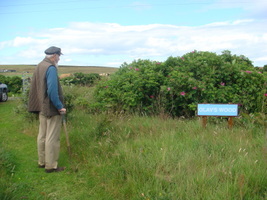 Natural woodland, such as that at Berriedale on Hoy, is now rare in Orkney. For the history of trees in Orkney, see the Orkney Landscapes website. It is sometimes said that present conditions in Orkney make it almost impossible for trees to grow, except in very sheltered areas. It is certainly difficult to establish new woodland, and young trees need careful attention if they are to thrive. The experience is that losses may be high and it is difficult to predict which species will survive. Oback burn runs through the wood. A woodland glade and spruce trees. Olav Dennison at the entrance. Olav's Wood on South Ronaldsay has been established over many years. The first plantings took place in the mid 1970s, with major planting beginning in the 1980s. It continues to be developed today. The woodland is approx. 4.5 acres (1.8 hectares) in area and runs down a hillside towards Windwick, alongside an attractive burn, Oback Burn. Trees and shrubs from many parts of the world have been successfully established here and the wood now forms dense forest in some places and more open woodland elsewhere. For some of the exotics, this may be the northernmost point in the British Isles (and possibly elsewhere, given the latitude: 58 45' N) where they currently thrive, making this woodland of both horticultural and wildlife interest. 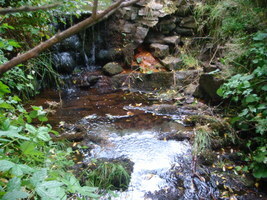 Helen and Stephen Manson of Cellardyke and Olav Dennison began planting the woodland and have been primarily responsible for its development and maintainance. The woodland is a testimony to these people and to others who have contributed to the development of the woodland and surrounding area. Woodland: The woodland areas range from dense coniferous plantations, through to deciduous areas, and open mixed woodland. Typical woodland plants include primroses and the attractive Wood Horsetail (Equisetum sylvaticum). Heathland: Areas of heathland are found within the woodland and on its borders. Typical heathland plants include Heather (Calluna vulgaris), Bell Heather (Erica cinerea), Tormentil (Potentilla erecta) and Crowberry (Empetrum nigrum). Open grassland: There is a variety of open grassland types on the site with characteristic plants. Waterside and wet woodland: Alongside the burn may be found waterside plants such as Marsh Marigold (Caltha palustris) and the very common Yellow Flag Iris (in Orkney called `Seggs') (Iris pseudacorus). 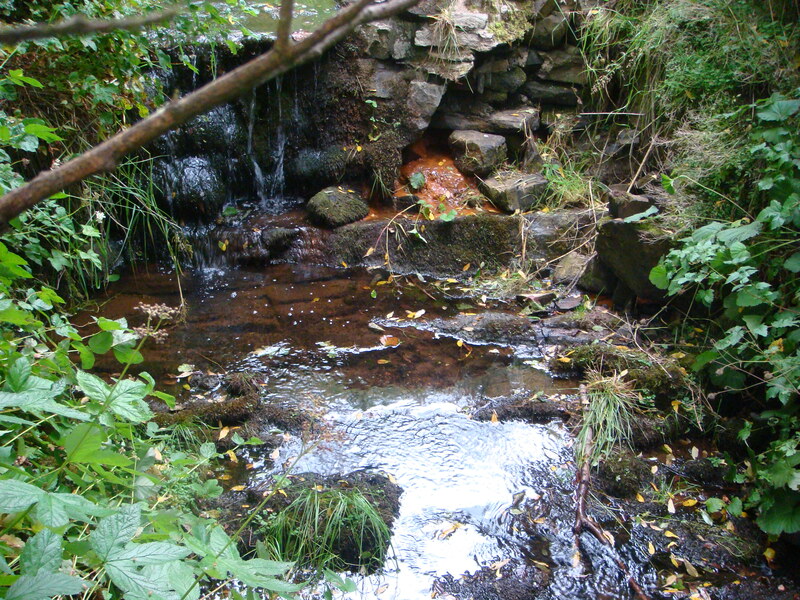 Freshwater pools and stream: The burn itself contains a variety of aquatic plants. This range of habitats supports a wide variety of plants, birdlife and invertebrates. Indeed some species new to Orkney have been discovered in Olav's Wood and some species are recorded in Orkney only in these woods. For details of animals and plants on the site, see the wildlife pages. Location: Olav's Wood, Oback Burn, Cellardyke/Sillerdyke, South Ronaldsay, Orkney, KW17 2RN. OS Grid reference: ND449869. 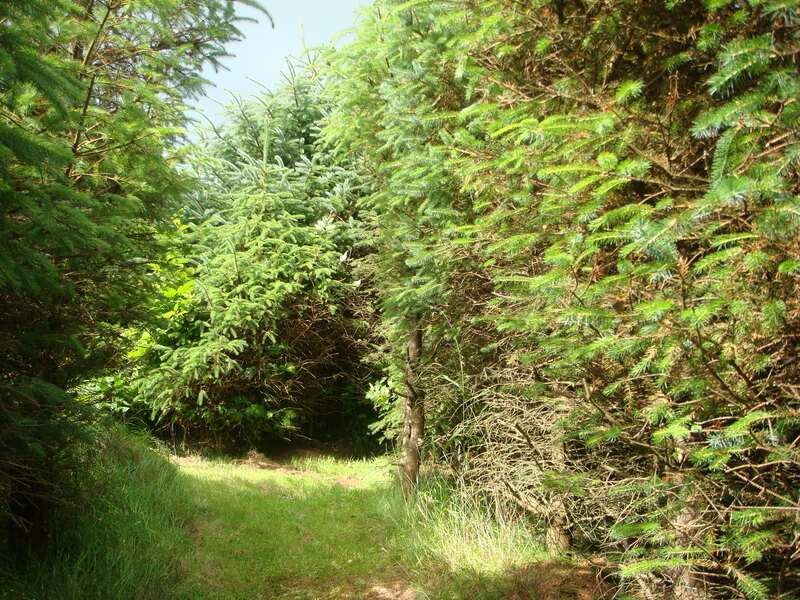 The woodland is best entered from the Windwick road, off the A961, the main road from Burwick to St. Margaret's Hope. Entrance is through a gate on the right between Masseter and Linklater. There is a small carpark. Please use this considerately. The woodland is on private land and is not a public utility. Access is not easy and can be dangerous. Paths are uneven and steep in places and can be very slippery. There are unfenced steep banks and areas of open water. Because of these dangers, it is not a suitable area for unsupervised children, and adults need to take great care. Parking: There is a carpark at Olav's Wood. Please park considerately and allow space for others to park. Ensure that you leave the roadway completely free. The road is used by wide farm vehicles and your car should not obstruct their movement or narrow the roadway. Please remember to take your litter with you and, if you are walking your dog, please behave responsibly and do not allow dogs to foul the woodland. Text and photographs from this website may be used for non-commercial purposes as long as the source is acknowledged "Olav's Wood website: www.olavswood.org.uk". For commercial purposes, contact the site manager.